En marzo de 2012 la Universidad de Nevada publicada dentro de su colección “Basques Series” el libro: Reclaiming Basque: Language, Nation, and Cultural Activism, de Jacqueline Urla, perteneciente a la University of Massachusetts . The Basque language, Euskara, is one of Europe’s most ancient tongues and a vital part of today’s lively Basque culture. 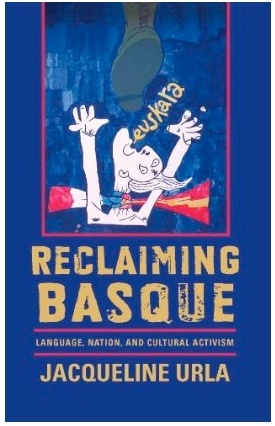 Reclaiming Basque examines the ideology, methods, and discourse of the Basque-language revitalization movement over the course of the past century and the way this effort has unfolded alongside the simultaneous Basque nationalist struggle for autonomy. Jacqueline Urla employs extensive long-term fieldwork and close examination of a vast range of documents to uncover the strategies that have been used to preserve and revive Basque and the various controversies that have arisen among language advocates. Reclaiming Basque offers a new perspective on language activism as a dynamic and evolving social movement. It addresses the complex issue of what it means to speak Basque in the contemporary Basque Country, as well as the roles of minority languages, language policies, and cultural identity in a globalized world. En la edición de febrero de 2014 de la revista American Ethnologist, la publicación de la American Ethnological Society (AES), ha publicado un amplio e interesante análisis del libro, realizado por Kathryn Woolard, de la Universidad de California. The Basque language revival movement has become almost impossible for outsiders (within Spain as well as internationally) to perceive except through a filter associating it with radical Basque nationalism and its armed incarnation, ETA (Basqueland and Freedom). As Jacqueline Urla recounts in the epilogue of this book, a Spanish cultural elite and the central Spanish state under socialist as well as conservative leadership have ever more insistently imposed this filter in recent decades.